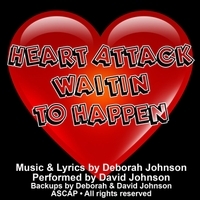 This is a parody version of Deborah’s song “Heartbreak Waitin’ to Happen” on The Hero Inside album. This song should help trainers and health professionals all around the world! If you know someone who would enjoy the song, please pass it along! Credits: Main vocal by David Johnson. Backups by Deborah and David Johnson. Written and arranged by Deborah Johnson. DEBORAH JOHNSON, is a National Recording Artist, Composer, Speaker and published Author. She has recorded over a dozen albums, written 3 original musicals and has appeared on many stages around the country and world. She also appears with the headliner piano/vocal duo Double Grande. Her new internationally released book, Stuck is Not a Four-Letter Word, is garnering great reviews. (on Amazon & Barnes & Noble) She is also a multiple Grammy Award Contender.